ShortScale :: View topic - compensated saddles for Tele on a shortscale? compensated saddles for Tele on a shortscale? Posted: Wed Mar 28, 2018 8:58 pm Post subject: compensated saddles for Tele on a shortscale? if compensated saddles for standard scale can be used in short scale guitars with success. 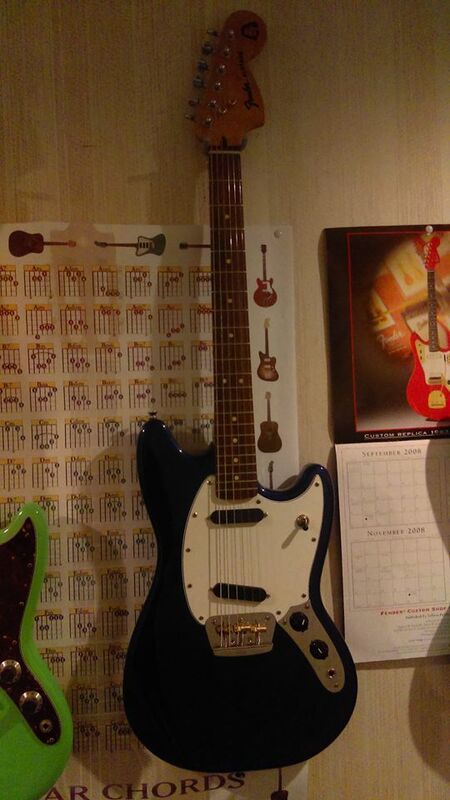 Say compensated saddles for Telecaster used on a Squier Duo Sonic, which has a 24'' scale. It may be due to other factors, so I'd like to know about the saddles first. Anyone knows about this subject? i believe the guitar I built for username: AL has them on there. its a converted toronado bridge, with compensated telecaster saddles in it. 24" scale that we converted a mustang into a hard tail duo sonic. you will have to ask him about intonation though. that stuff is over my head. I'm too busy rolling around on the floor with my guitars and throwing it into things to make sure it sounds perfect. I've used them before on a 78 musicmaster with excellent results. There's no issue at all. Any time you're using non adjustable saddles you probably won't achieve 100% perfect intonation unless you start experimenting with custom string sets. Even on a standard scale instrument, the individual string gauges in a set of 9s will have different properties to a set of 11's. I'm probably the worst person on earth to give advice . Three saddle bridges are obsolete when it comes to the evolution of fretted instruments. There's a reason it was one of the first designs, before Strat bridges and Tune-o-Matics started to give players the freedom to adjust their intonation according to the MANY variables that can affect it, including but not limited to, string gauge, string metals, action height, neck relief, neck radius, fretwire size and how hard the player actually plays with their fretting hand. No amount of discussion on an internet forum is going to make any three saddle bridge able to be intonated as perfectly as even the cheapest adjustable six saddle bridge. HOWEVER, people got by just fine on Teles and Musicmasters without compensated saddles for years and nobody knew any better. I mean in theory you're always able to either have every other string perfectly intonated, or have all six slightly off but probably close enough. The fact that compensated saddles were invented to attempt to aid this does not make them a one size fits all replacement for any guitar. The one difference you might be experiencing between a full scale and short scale, is the same reason your frets are closer together on your musicmaster. The shorter the scale or the instrument, the less distance it takes to vary the pitch. So yes, you're probably seeing exaggerated performance from your compensated saddles. Again, not a one size fits all, and will probably take some experimentation and maybe a little mix and match between compensated and non compensated saddles. Here's an article I just found through 5 seconds on google that probably explains it better than I can. I tried a set of compensated saddles on my CV Duosonic and didn't think they intonated well. My Peterson Strobe tuner confirmed it. I ended up using a six saddle Strat hardtail bridge and intonation was significantly better. Maybe it makes a difference what gauge of strings you like. I use Gibson Brite Wires .010-.046 on all my guitars, regardless of the scale. I hear of lots of people stepping up to .011's on short scales. There's no such thing as perfect intonation, as your own fingers are too much of a variable. If you've had your wheatabix you'll press harder than on days when you didn't changing the intonation on every string depending on what finger you use... don't sweat the small stuff.